Adele was born at Häggarp, but in April 1880 she emigrates to Illinois along with her much older brother Carl. They settle with their sister Hannah and her family in Moline, Illinois, and take on the americanized names Adelia and Charles Ahlforth. In 1893 Adelia finds herself in Spokane, Washington, where she marries a baker’s son, David Stussi from Icicle, Co. Okonogan. Adele and David’s marriage 1893 in Spokane. 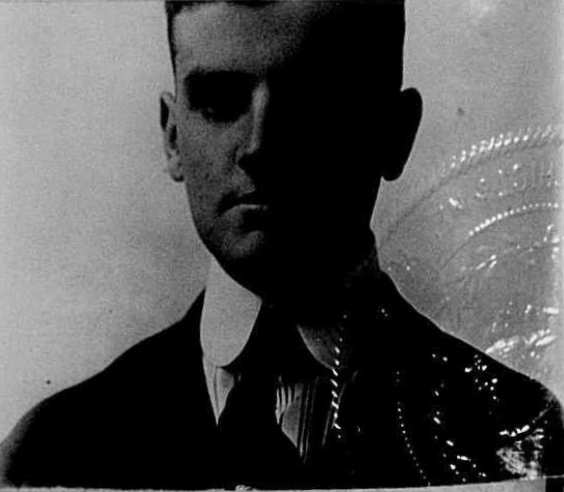 The photo attached to the passport application 1917. His hair and his eyes were brown. David’s parents, John Rudolphe Stüssi and his wife Annie, had come from Switzerland in 1854, and at first seem to have settled at New Glarusicon-map-marker, a Swiss colony in Wisconsin where David was born in 1862, but the family moved to Mantorville, Minnesota when he was 3 years old, and within a few years went on to Stillwatericon-map-marker on the Minnesota-Wisconsin border, where he grew up. He was probably named for what was likely a cousin of his, David Stuessy/Steussy, born in New Glarus a few months before him. They were a quite important local family in New Glarus icon-external-link. 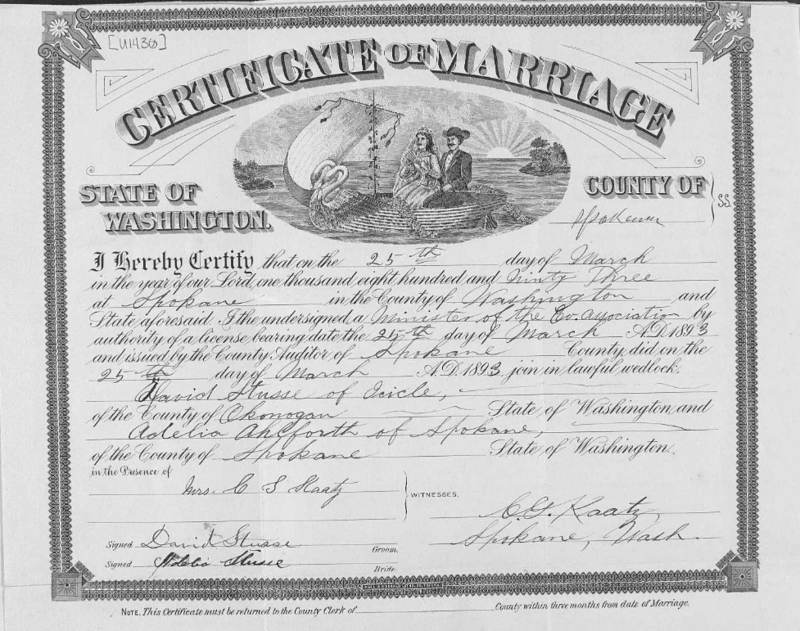 David and Adelia’s marriage certificate with their signatures. David and Adelia were true pioneers. In October 1894, David and his older brother John followed a gold rush to Rossland, British Colombia, which by then was only a miners’ camp. Presumably, his wife went with him, although no mention of her appears. His log cabin at the end of Columbia Avenue was the first lumber building in the town, and perhaps the second building after the founding miner Ross Thompson’s home. There was a growing number of mining prospectors and miners coming to the site, many of them from the States, and David quickly opened a small grocery store at the site of what is now The Garage Restauranticon-map-marker. He also provided the the town’s first postal service, leaving the mail in a cheese box behind the door and letting people sort their own mail. However, within a few months the population had grown to a thousand icon-external-link and the cabin became much too small for the purpose, so the following spring he built the Stussi Block across the street, on the south side of the Avenue, in which a portion of the main floor was set aside for Postmaster Stussi and his mail. He resigned from his duty as postmaster in July, when a successor took over. Within a couple of years, Rossland had grown to one of the largest cities in western Canada, due to the gold rush. David is still remembered as the founder of the town’s first post office. The couple eventually settled in the gold mining village of Dixieicon-map-marker in Idaho, where David is by 1900 a gold mine manager. Dixie is still extremely remote today, and must have felt even more so at the time, but they were probably used to that kind of environment already at this stage. They do not seem to have had any children, and Adele appears to have died soon after this, because apparently he married the young woman Marion Emma Savage (b. 1880) on 20 August 1902 in Union Co., Oregon. She was of British descent. For some reason he is then said to be from New York. In 1909 they emigrate back to Canada, and the year after that he seems to work as a mining agent in the Resurrection River Valley at Kenai in Alaska. The area has just received its first short railroad. His wife is not with him, but he is recorded as being a married man. In 1911 they live in Prince Rupert on an island off the coast of British Colombia, once more together with brother John Stussi. Religionwise David is recorded as being a free thinker. He now works as a railroad contractor, helping The Grand Trunk company build the Pacific Railway that is to connect Prince Rupert to the mainland. Emma dies 3 March 1912, only 32 years old, and the following year David moves back to the States to settle permanently in Seattle, where he establishes himself as a broker. His nationality is by now given as Canadian. However, in 1917 he decides to go to Tahiti via San Francisco, in order “if I like Tahiti, to make it my home”, as he states in his passport application. We never hear word of him again, so presumably Tahiti did agree with him. Etiketter: Alaska, Canada, Idaho, utvandrare. Lägg till bokmärke.